Rabbit Stew: Hubert's Cookery Tips: Cooking Rabbit with Olive Oil? Hubert's Cookery Tips: Cooking Rabbit with Olive Oil? I'm no gourmet; I don't haunt delicatessens in search of edible exotica or loiter in puddles of my own drool beside the doorways of fancy restaurants. I don't really do posh nosh. I do, however, regularly buy olive oil and, when I can afford it, I'll spend extra to get a bottle of oil that has a bit of taste to it. The furthest down the 'extra' road I ever got was a bottle of Nunez De Prado. I came across it because I'd spent most of a day walking around the giant halls of the Tate Modern gallery in London and I was knackered, blitzed with high culture and very hungry. Wildly against my better judgement and heedless of the real state of my bank account, I decided - the hell with frugality! - to have a snack in the Tate's own swish restaurant. I ordered the cheapest thing I could find and a devastatingly stylish waiter appeared bearing a tiny plate which was artfully adorned with one pink, glassy rectangular block (which turned out to be pressed hock of ham), one purple blob (a beetroot puree of some kind), a hand-hewn chunk of bread, a small pile of sea-salt flakes - and a circular pool of pale green oil. All of these peculiar components turned out to be individually delicious but the star was - to my surprise - the oil: it was just unbelievably rich, complex and delicious. I was astounded; I had no idea that a simple thing like olive oil could get so good. 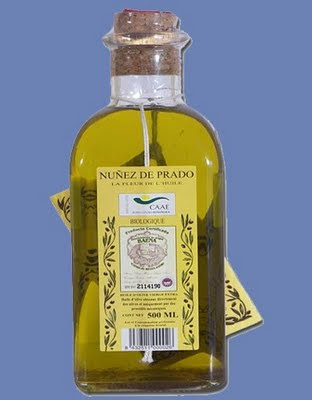 I consulted the menu again: "...Nunez De Prado Oil". O.K, then. When I got home I tracked down a supplier on the net, bought a bottle straight away and, for a few months after it arrived, every salad I ate was a feast and every dull boiled bit of veg - when garnished with a few drops of this stuff - positively shone on the palate! It was wonderful stuff. It ran out, of course, and, because it's about twelve quid a bottle (about a fifth of my weekly income right now) I didn't buy another one. I did carry on using olive oil for almost everything I cooked, though - only I'd use Tesco 'Extra Virgin' at about a tenth of the cost. This brings me - finally - to rabbit. Don't cook rabbit with olive oil. Well, even basic olive oil, I've decided, is just way too strong for rabbit. Rabbit - I've finally understood - is a delicately flavoured meat and a feisty, noticable oil like this just gets in the way, interferes with, clashes with the flavour of the meat - and then hangs around afterwards. I'd been suspecting this for a while but, since I'm a bit slow on the uptake - in this as in most things - it's taken a while for it to percolate through my bonce that something might be amiss in the kitchen. The last rabbit I got, by way of experiment, I cooked with sunflower oil only - and it was a huge improvement: there seemed to be space, this time, for the flavour of the meat to sit with the thyme and the rosemary; it was altogether fresher and less cloying than when cooked with olive oil. Well, yes - that's quite enough Fanny Cradock impersonations for now, I think. Back to shooting stuff. Great Site. I from Naperville, Illinois USA. I shoot rabbits in my yard to control their population. RWS 48 .22. I don't eat them though. But I leave them as food in a nearby field for foxes and Cayotes.